Civil Aviation Authority of Singapore’s (CAAS) has been enabling the growth of the air hub and aviation industry in many ways – by making safety a priority, providing air navigation services and developing Singapore as a Centre of Excellence for aviation knowledge and talent development. 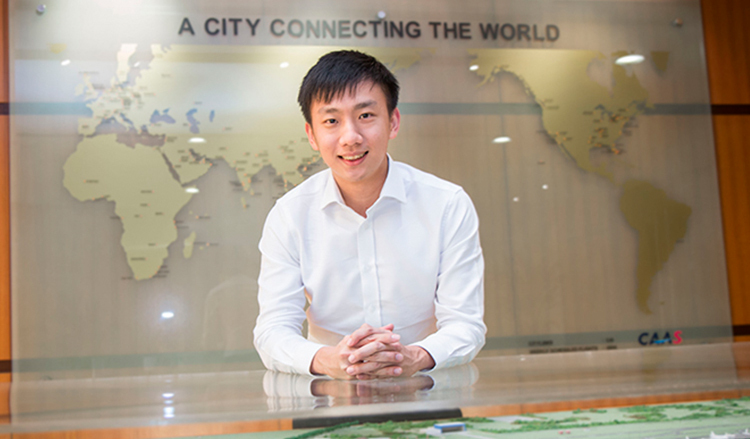 Working for the CAAS’ Air Transport Division is CAAS Undergraduate Scholar Chen Yiliang, who tells us how his passion for aviation led him to his role as Deputy Manager of Air Transport today. Growing up with a father who worked in aviation sowed the seeds of Yiliang’s interest in the industry. He says, “It started when I attended air shows with him as a child and flying – or rather, trying to fly – his radio-controlled airplanes. CAAS is naturally a career fit because it is a confluence of both my desire to serve Singapore and my interest in aviation.” He also believes that it was this deep-rooted interest that made him a deserving recipient of the CAAS Overseas Undergraduate Scholarship. The Scholarship opened the doors to endless opportunities for Yiliang to grow within the industry. For instance, he got to experience three internships at CAAS which deepened his understanding of the organisation. These allowed him to comprehend how he will be able to best fit and complement the organisation when he officially commenced work.